Okay! Back to share the little details on this faux coffee bag! 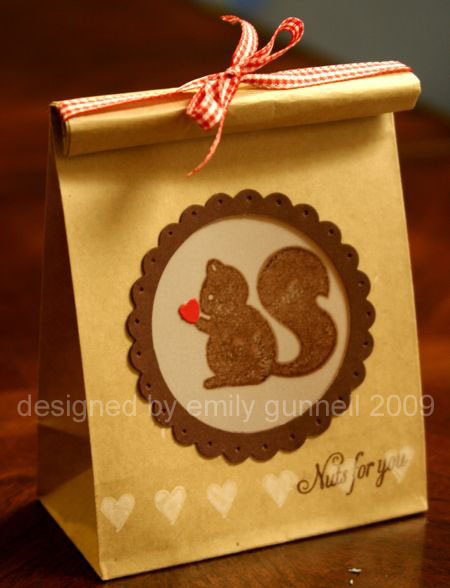 This was created for the PTI challenge yesterday to decorate a little bag. As I was reading thru the challenge post, she mentioned coffee bags and immediately I was wishing I had some. I love how they close simply by rolling the top and folding the closure back, perfect for little treats! Fortunately, what I did have was several of these kraft bags that I picked up from Target to use for the boys’ Valentines this year, so I decided to take and extra one and create a coffee bag. It really was very easy! I used StazOn white to stamp the hearts along the bottom of the bag and let them dry. Then I punched the scallop out of Chocolate Chip with my Marvy Giga Circle Scallop punch and used my Coluzzle to cut the middle out to frame the window. I pierced each scallop, then adhered it to the bag. Next, I adhered the vellum behind the window and stamped the sentiment with Chocolate Chip ink. The heart is from my handheld Martha Stewart punch and was adhered to the focal image. The last touch was to roll down the top and figure out a closure. I thought of using a twisty tie, but it was too short. Instead I punched a hole on either side of the top of the bag, threaded the red gingham ribbon thru, rolled the top down and secured with a bow. I think my boys will enjoy getting one of these for Valentine’s Day, filled with pistachios! I love this, very cute! Super cute Emily! I love how you rolled the top just like a real coffee bag.